The Attaché, from FFA, is a triumph of form over functionality. 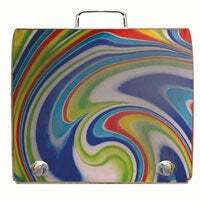 This laptop case comes in no less than fifteen designs (our favorite was Swirl). Visually, at least, it’s a lot nicer than those generic black shoulder bags most of us use to haul our PowerBooks. You can opt for a simple, envelope-like shell, or accessorize with add-ins that’ll hold your phone, PDA, files, and more. The Attaché may not be the sturdiest thing we’ve ever seen—the interior padding looks thin, and the thin shoulder straps look as though they’d chafe quickly. But the company backs it up with a year’s warranty, and, after all, why let a little practicality get in the way of style? FFA focuses on the wholesale market (customizing the Attaché for corporate customers) but says that it’ll sell to individuals who contact the company online.